You start what feels like a big game of tetris: piling tomatoes, aligning zucchini, bending kale, and filling the gaps with onions. But no matter how good you are, by the end of the process half of the produce is still sitting on the kitchen table, and you’ve somehow grown a disdain for your mother for not having shown you how to do it — except that she had two fridges (at least) and maybe two freezers, and she didn’t really needed any logistical skills in this department. So now you are left with but one option, and that is start cooking. Unless - of course - you own a flock of sheep or a herd of cattle, then you can feed the animals and you’re pretty much good to go. However, most of us don’t have that option, so we’re back to square one: cooking. That was me a couple of hours ago. Having to face the consequences of my Farmers’ market shopping greed. I started by cooking all the spinach and made an awesome Greek style quinoa casserole with it — which you will hear all about in due course. With some of the avocados, I made this delicious raw/vegan/paleo chocolate chia pudding. Now you might argue that I have an obsession with raw chocolate puddings/mousses. I’ll concede you that. It’s no secret that I already whipped up a Raw Chocolate Pudding and a Chia Chocolate Mousse. However, both those dudes are made with banana. This one is different, in that it has avocado (and coconut oil) in it. The texture and the taste are quite different from the others. Just as awesome though. 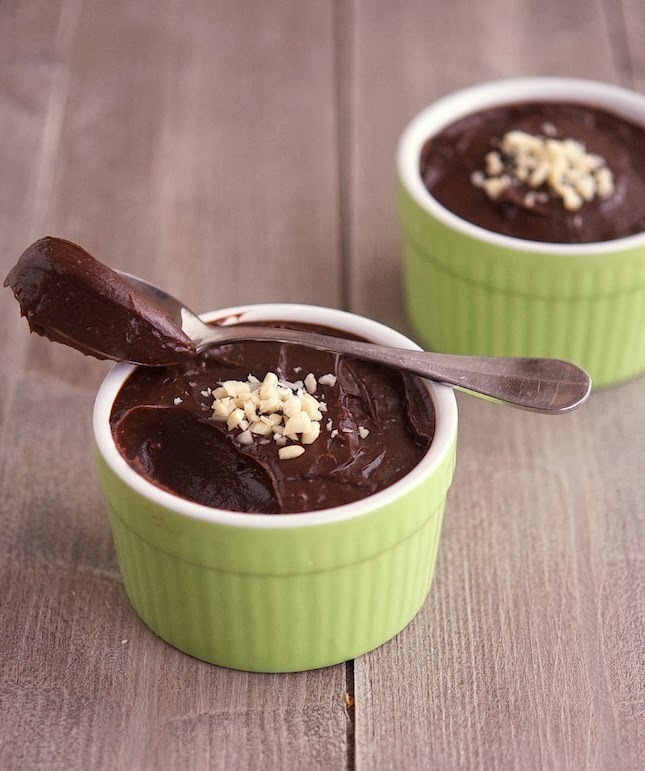 My sis - very skeptical at first about using avocado in a chocolate pudding - is now totally into this super silky, smooth and velvety pudding. Trust. Chocolate Avocado Chia Pudding Print this recipe! Looks sumptuous and delicious Mike! It's so rich, chocolatey, and creamy you forget it's good for you! Oh, almost forgot. That pudding looks amazing! Wow another very inviting recipe, these look so good and I bet a great chocolate fix! The best chocolate fix eva! Looks amazing, although I'm going to try it sans the coconut oil. Tomatoes taste better when stored outside of the refrigerator, BTW. Why no coconut oil? You don't like it? Oh my. Chocolate fudge or brownies in a liquid form. Yummy. Avocado with chocolate = slow guilt free death. Any time. Yup Olena, nothing better than avocado + chocolate! Chocolate goodness, yummy. I've wanted to try avocados in desserts for a while now, I have no clue why I haven't, intrigued, I guess. Looks like a great dessert. It is Ash, I'm pretty sure you'll love it! LOL, you've accurately described my Farmers Market shopping trip this weekend - I came home with massive bags of cavolo nero and purple kale. Most of which ended up in minestrone soup. These puddings & the previous brownies do look amazing and I will definitely try them both. That minestrone sounds amazing Nesa! Is cavolo nero the same Tuscan kale? A friend of mine calls it dino kale...which makes things even more confusing! Hahaha! This SO sounds like me when I return from the market! I always get carried away and go WAY overboard then I have a hard time fitting everything in the fridge. And there's only one of me, you know... I think I tend to forget that! But put me in the presence of beautiful fresh produce and I get just like a kid in a candy store. I totally lose all sense of self-control. It’s probably a good thing that I’m shopping alone and only for myself. I can’t even imagine how ugly things would get if I got to shop with someone who shared my craze. I think we’d need to buy a truck just so we could get our precious cargo back home! A pick-up truck would probably do the trick but then what to do with all that produce? Sonia, girl, you're a such a show-off! can you do this withought the chia seeds or no? OK, this is amazing! My only regret is I didn't make a double batch. I had to add a little milk to make it work in my blender, as it was too thick....what wonderful yumminess! Oh no Dori, make sure to make a double batch next time! I'm a confessed chocoholic and this sounds like heaven to me! Never used avocados in sweets before but I can very well imagine the rich smoothness it adds. Very clever idea to use the chia seeds to thicken the pudding. 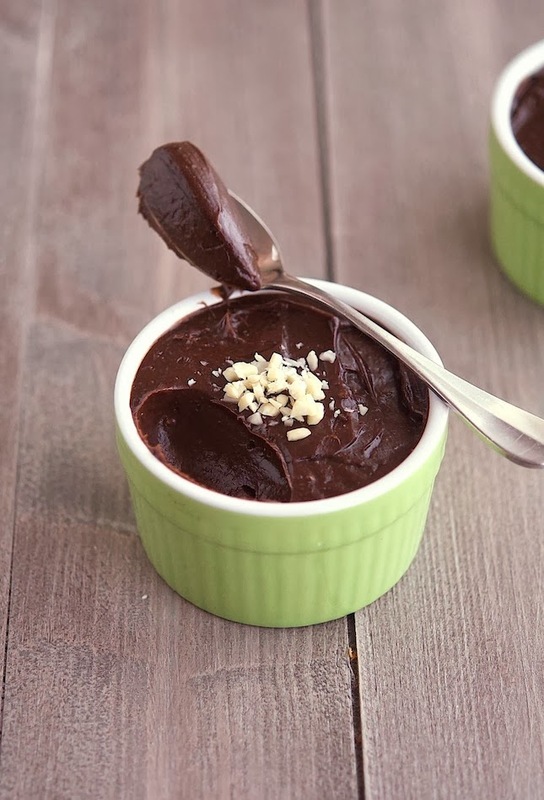 Avocado + chocolate = marriage made in heaven. You should totally try this Daniela! Do you think it would be possible to use flax seed meal instead of ground chia seeds? I have the whole chia seeds, but not ground! This looks amazing! Emily, use whole chia seeds - as long as you're not bothered by them (I'm certainly not). Otherwise leave them out it will still be awesome! I'm not fond of coconut so I've avoided purchasing coconut oil, but I really want to try this recipe. Can you recommend anything that I could sub for the coconut oil? You can replace it with butter, but just 2 tablespoons, instead of 3. So good! What do yo think? Four servings? It's hard to stop eating this stuff. I'm going to have to portion it out in order to not over indulge. Ha! It's difficult to not over indulge with this pudding, once you taste it there's no stopping! BTW, I have this down to 3T of xylitol for sweetener, and it is still very satisfying. Trying to avoid sugar though I know raw honey is awesome too because I made that way first. Mike, do you find this to be a little sugary at times? Maybe my avocados weren't big enough, but I feel like the maple syrup ended up being the dominant flavor. Hey MK, it does depend a lot on the avocado size. Sometimes Hass avocados are so tiny you need to use 3 instead of 2. Btw, have you tried it using honey? I definitely prefer it over maple syrup. I haven't yet, but I am definitely going to try this again with adjustments. The texture is insanely good; I can tell it's worth a little trial and error til I get it perfect. :) Thanks! That's awesome MK! I have just perfected a new version of this pudding using orange, I'm going to post it this weekend. Stay tuned! Quick question - can you use raw cacao powder instead of the cocoa powder? Will this change the taste/flavor? You absolutely can; the flavor might change a tad but I don't expect anything too drastic! This is a great recipe - I eat a version of this for breakfast every now and again - the version I eat has a lot more Chia seeds in. I had it once after a hard training session and found that I felt better - so it is great as a recovery meal/ treat. I did not have avocados so I used bananas instead. Not as smooth but still very good and no one knew the Chis seeds were in the mix. That is until after they eat all of it. Thanks for the awesome pudding recipe. 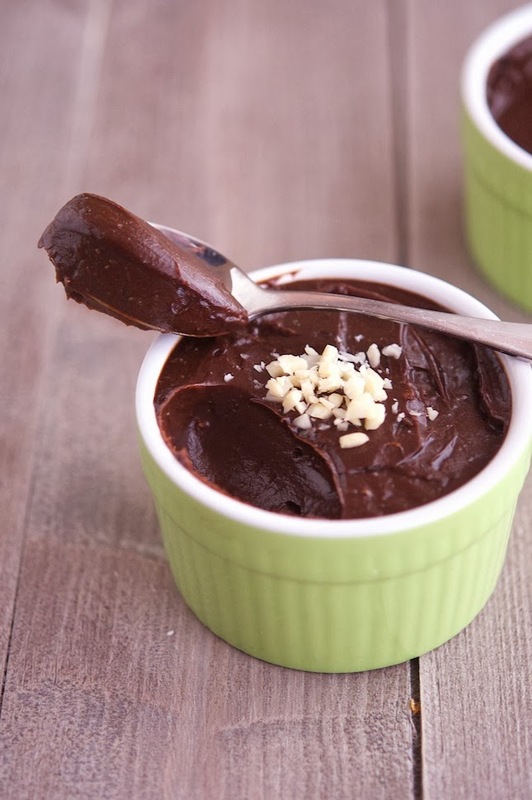 FINALLY - a pudding with no nut milk or bananas! Yeah. Awesome recipe!! I love avocados with chocolate! Avocado dark chocolate chip cookies are amazing if you haven't tried them. Oh and Avocolada is one of my faves =)... avocados, coconut milk, and pineapple with whatever sweetener you like...soooooo good! Question-what is different about putting chia seeds straight in the blender vs the ground seeds? does it work just as well? Was sad to see that this recipe is high in carbs, and no fiber content listed. As a type 2 diabetic, I look for recipes that I can make and still eat a bit of some sort of dessert. As a person who avoids all simple carbs and pays attention to the total carb (complex) count and does the math (subtract fiber from carb total and you have the actual carb load), I would have appreciated a fiber and sugar count. But, oh well. I know I am late to the party, but according to running the ingredients through the sparklepeople. com recipe nutrition calculator, this recipe (I put in 2 large hass), based on a 4 serving count, numbers are PER serving. I don't have diabetes myself, but cook for someone who does. This is now my favorite dessert! 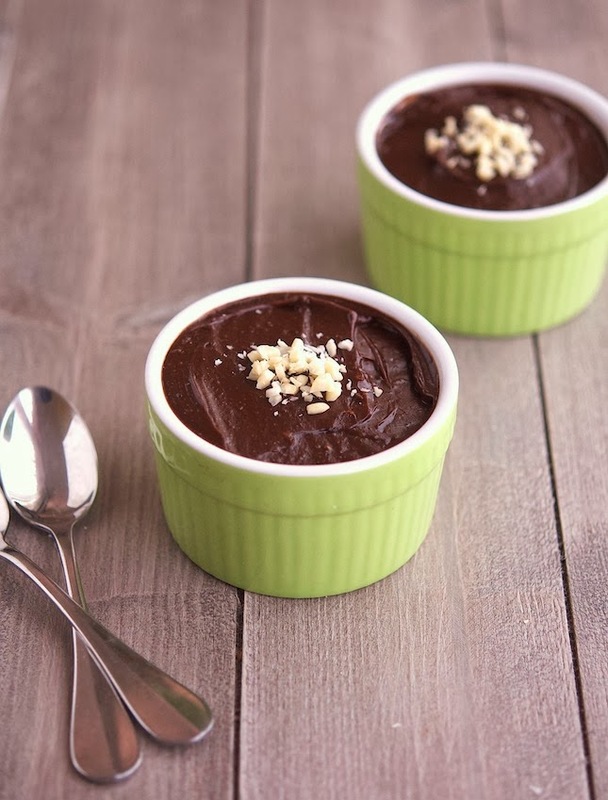 A healthy chocolate pudding - it is an awesome recipe!! Thank you for posting it. Wow made this it was awesome. I extended it with some low fat Greek Yoghurt and added more Chia seeds. Amazing how this thickens up! That's a great idea to add Greek Yogurt, I might need to try it myself! I am thinking if making this recipe for my kid, as it contains 3 of my faves for his diet: avocado, coconut, and chia seeds! I was wondering if you had any recommendations/thoughts re: substituting carob for cocoa and agave for the honey. Thanks! I don't see why not. Subbing agave for honey should cause no prob. As to carob, I'm not the biggest fan of its flavor but it should work as well! My first batch I used 50/50 cocoa to carob. Not great. The second batch... toooooo die for. I had to stop myself from licking the bowl so there was enough to dish up into our ramikins!! I've made this last night, it's so freaking delish! I know this was super successful as a rich, unctuous dessert, because I spent the whole evening beating myself up for "cheating" on my healthy eating plan- had to keep reminding myself that all i'd had was avocado and banana (we only had 1 1/2 avocados, so subbed the remaining half with a banana- worked like a charm!)! Hahaha Ryan, it's almost too good to actually believe it's good for you! I added a bit of milk and a ripe banana. My avocados were pretty small. Super delicious! That's awesome, I'm so glad you liked it! My first time working with avocado and chocolate together... It was awesome! My mum liked it too:) Thanks a lot! Oh, yum! This sounds wonderful, and I love the idea of sneaking avocados into my husband's diet without him knowing… Now, if only I had an avocado tree! I grew up and spent a good part of my adult life around people with avocado trees, which spoiled me rotten. The quality of the avocados in my local grocery stores is not predictable. But I will try this. I'm so with you on having an avocado tree, I want to move to Florida just to have one. Ha! Look how creamy this is! I cannot wait to try this out...I love adding avocados to desserts. So many healthy fats and so dang delicious! Hi, I just recently discovered your blog and would love to give this recipe a go - in fact I just went out and bought a blender so that I can! Thanks for the blog - it's awesome! Just plain YUMMY! I have made twice and does not last more than 5 days in the refrig before it is devoured. Just plain YUMMY! It does not stay in the refrig more that 5 days before I devour it. I can keep them in the fridge for 2-3 days? Just wondering...it will be ok to frozen the pudding? Just started cutting dairy, gluten, and processed sugar last week... this was AMAZING! Super rich and creamy! Amazing! Instead of cocoa powder I used 2 bars of dark chocolate (melted) and cut down on honey. That gave the pudding a very creamy texture and a super bust of chocolate flavor. Awesome recipe, I added some natural pb and some coconut milk and it made quite the difference! Keep these great recipes coming man! I just bought 5 avocados so now I know when some of hem are going. Apples and onions should never be stored in the fridge. Tomatoes and avocados in the fridge only if they are very/over ripe. That should free up some room for you. I don't have a blender or many electric appliances -- any suggestions on how I can make this?? I've been wanting to try it for so long! Thanks!! This makes awesome popsicles! Thanks. A great recipe for texture-reasons: It is importantly smooth! Many people don't like the 'tapioca-like' texture of unblended chia pudding, and so stay away because the 'seedy' texture of most people's recipes. This, and the commented ideas that follow (coconut milk, PB or AB, etc) are all great recipe ideas to get people past the texture hurdle & into healthier dessert options. I just made this and it's delicious. A great way to use up my avocados which I bought too many of and hate to waste since they're pricey. Next time, I'll try it with honey since you liked it better that way. I made it with bourbon barrel maple syrup this time.